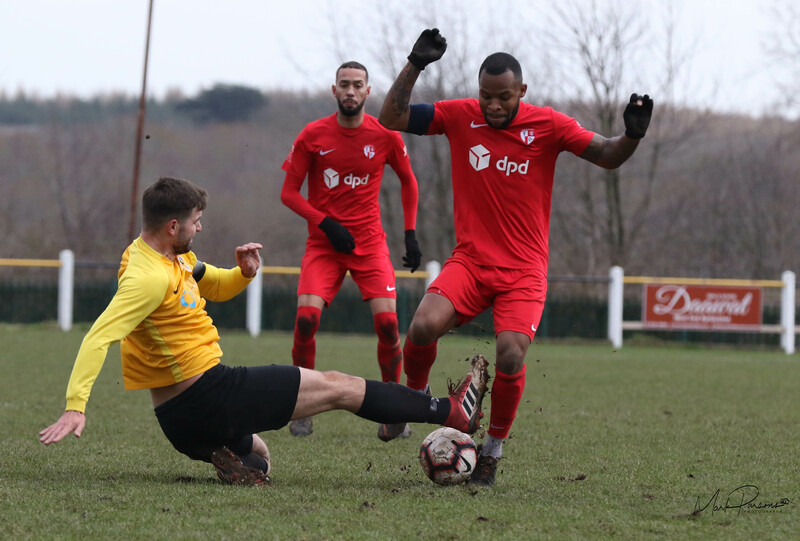 AFC’s last outing was a 5-1 defeat by the Racers two and a half weeks ago, and it was the same story this time as the men in yellow cruised to victory. They were 4-0 to the good by half time as they took advantage of some slack defending to romp into a comfortable lead. And they extended it further with a fifth after half time, Hinckley with only Sam Belcher’s late penalty for consolation on a tough afternoon for John Ramshaw’s men. AFC made five changes from the side that took to the field against the Racers last in mid-January – and the disjointed nature was evident early on. 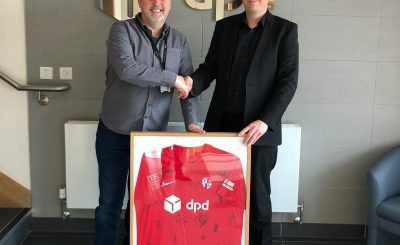 They were missing Yinka Adebowale through family reasons, while Grant Ryan has been recalled by AFC Mansfield and Jean Dakouri was suspended – and Hinckley missed his influence on the midfield. Just two minutes had passed when Warwick took the lead, and from then they never looked back. From a Hinckley attacking free kick, they broke and Ben Mackey was tripped by Callum Willimont’s sliding challenge. Mackey lashed home the resultant spot kick to set the Racers on their way. AFC had a chance of their own just moments later when neat link up play between Chris Hollist and David Jones fed Oli Roome, who squared across the face of goal where Tyrone Burton was not far from sliding home an equaliser. Belcher then curled a free kick over before Chris Johnston bent one just wide of the far post as the sides exchanged efforts from range. And they got it in the 18th minute when Trea Bertie found the bottom corner from the edge of the box. With Hinckley already facing an uphill battle, Belcher and Louis Hamilton both called visiting ‘keeper Charlie Bannister into routine work with efforts from the edge of the box, before the ‘keeper came out quickly to smother at Hamilton’s feet before he could shoot. But the visitors often moved the ball more crisply than AFC did, and were clinical when they attacked as they added a third seven minutes before half time. 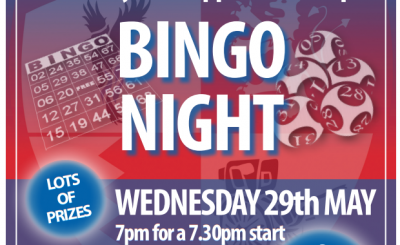 It was a simple goal and one Hinckley will be disappointed to concede – one long punt from the back catching out the defence and Bertie ran through to slot home his second. If that was simple, their fourth was even more so two minutes later. Bertie’s effort was deflected behind for a corner, from which Daniel Bartle’s delivery was met by a powerful header from the unmarked Joe Smith at the far post. As Hinckley sought some sort of consolation before the break, Liam Cross had one cleared off the line from Hamilton’s corner, before the resulting flag kick was met by Burton – whose crisp volley struck his own player on the line and rebounded around the post for a goal kick. That, in a microcosm, was AFC’s first half. Kicking down the slope after the break, the second was more even but Hinckley never really looked like making the visitors the slightest bit concerned about their lead. 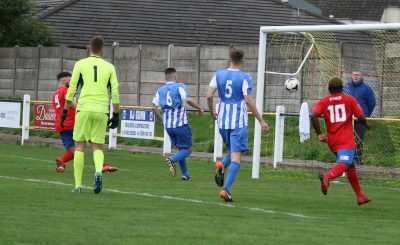 Bannister tipped over Belcher’s deflected effort in his first real save of the afternoon – and it was from the resulting corner, another attacking set piece for Hinckley, that the visitors threatened again. Bertie struck the post after a rapid counter attack, and George Warren saved well from Mackey’s rebound. 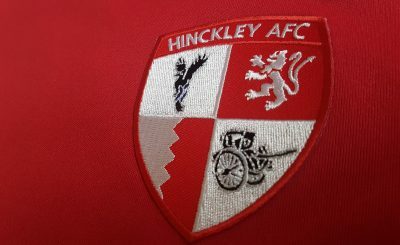 Hinckley continued to threaten more regularly as the game progressed, and they should have scored midway through the half. Anton Daniels pulled back for fellow substitute Ryan Murphy, who was denied by Bannister from close range, The rebound fell to Belcher, who failed to hit the target from eight yards. And the Racers continued to teach AFC a lesson in clinical finishing with another goal shortly afterwards. Warren saved well from Henry Leaver, but Mackey rifled the rebound into the roof of the net for a fifth. 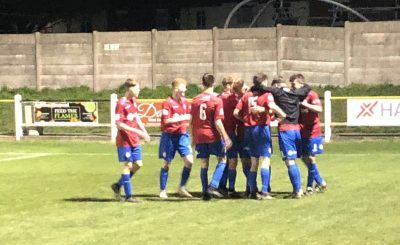 Hinckley, as Warwick did, continued to try and play football on a pitch that was cutting up – and put together their best move of the match as the game entered its final ten minutes. Play moved from left to right in a free-flowing move which ended with Hollist’s cross being slightly behind Murphy, who couldn’t adjust his body enough to get power on his header from which Bannister recovered to save on the line. But moves like that were few and far between – Warren saving from Leaver and pushing Bertie’s effort onto the post, before he combined with Cross to block out Mackey who should have scored. That saved Hinckley from what could have become their heaviest ever defeat – and after Bannister denied Daniels when one-on-one, AFC did grab a consolation in the final minute of normal time when Burton was upended by Lews Hayden in the box. Belcher stepped up to send Bannister the wrong way and cost the ‘keeper his clean sheet – the stopper so irritated that he booted the ball out of the ground and picked up one of the most needless bookings you will ever see. 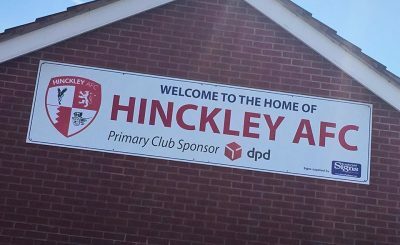 Not that the goal will bother Warwick too much as they continued their title challenge while condemning Hinckley to a third straight defeat.